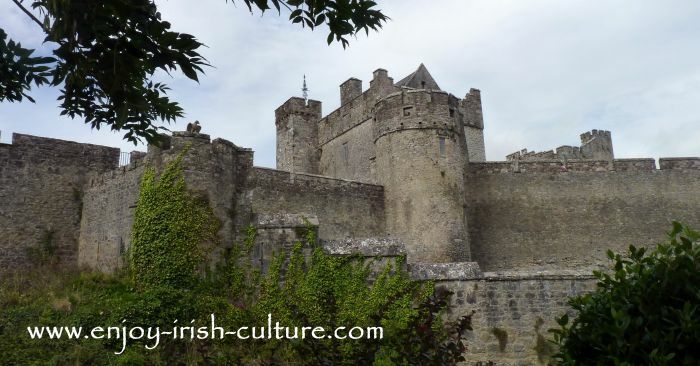 The Irish Castle at Cahir in County Tipperary is one of the most impressive looking medieval castles in Ireland and most definitely worth a visit if you are anywhere within reasonable travel distance. 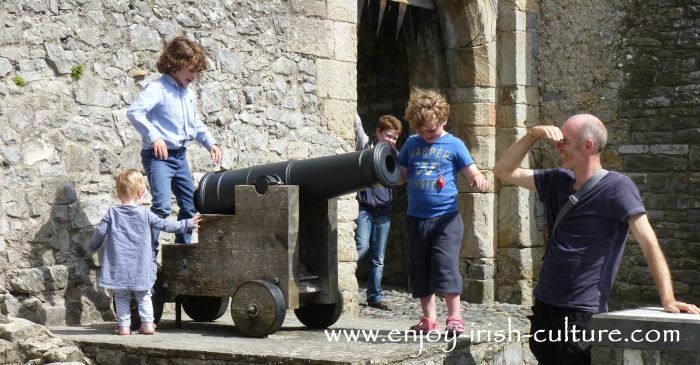 For anyone who loves castles, Cahir Castle is a pure treasure trove! One of the best places to visit in Ireland and highly recommended. This Irish castle has been used as a set for film and TV a good few times, and you may well be familiar with it without realising. Parts of the Tudors were filmed here, as well as Excalibur and Moonfleet. Cahir Castle is one of the largest castles in Ireland and one of only three in the country to have a functioning portcullis. The portcullis was our favourite feature really bringing medieval defence systems during siege warfare to life. This Irish Castle has been preserved extremely well. It was restored by its’ owners, the Butler family, in the nineteenth century after it had fallen to disuse and into disrepair. It was restored again under the care of the Office of Public Works (OPW) when it became a national monument in 1964. Cahir Castle is easy to find. 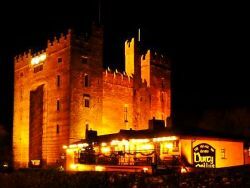 It is located right in the centre of Cahir town which is located on the N24 from Limerick to Waterford. Plan a 2 hour drive when travelling from Dublin or Wexford, an hour from Limerick, Cork and Waterford respectively. Cahir Castle is an OPW site, and prices are kept small. An adult ticket is currently 3 Euros, and children pay 1 Euro. Look out for special days such as ‘Heritage Day’ when you can get in for free. Here is a piece of advice though: Bring cash to pay for tickets and/or to purchase anything of the small offerings of books, postcards or souvenirs at the reception. The OPW don’t take credit cards or Laser! The castle is open all year round except Christmas week. Between September and May it opens at 9.30 a.m. and during the main summer season at 9 a.m. Closing times: between mid June and late August the castle closes at 18.30 p.m., and during the rest of the year an hour earlier at 17.30, except mid- winter from mid October to February, when they close at 16.30 p.m. Plan a couple of hours for your visit because there really is a lot to explore. Prices are regulated by the OPW and are kept very low at 3 Euros per adult and 1 Euro per child. The castle is great fun for kids, no doubt. But do make sure they are safe on the narrow stairways, especially high up on the castle walls. We are talking from experience here. 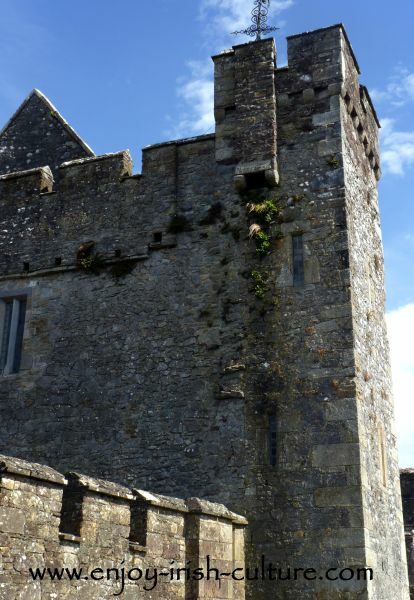 Find out why Cahir Castle was deemed the safest castle in Ireland during medieval times. Read here about the lovely medieval lifestyle at this castle. Find out the history of the castle. If you were to visit only one castle in Ireland, make it Cahir Castle. Take advantage of the excellent guided tours at the castle. Check at the reception for the next one. If there is a small wait- it’s really worth it. The tour will bring it all together for you. At the back of the castle there is a beautiful park, a great location for a picnic on a fine day, which could break your day before you move on to the next spot. If you enjoyed this article and like what we do, please pay it forward and spread the word! We provide some social functions (both top left and bottom) to make this easy.